The 2006 Olathe (Colorado) Sweet Corn Festival was a milestone event as it has come very far since it's humble beginnings in 1991. 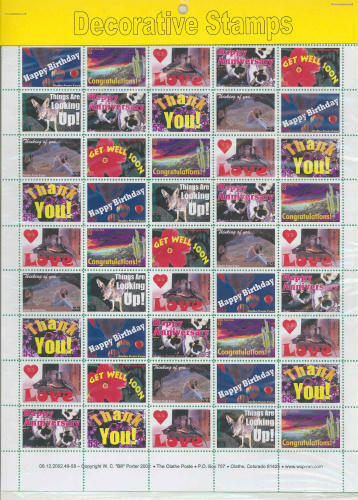 These special souvenir sheets of commemorative artistamps for the 15th Anniversary were created especially for the August 5th 2006 event. Of the sixty souvenir sheets printed, just over half of them sold on August 5, at the Olathe Corn Festival. So quantities available here are limited. 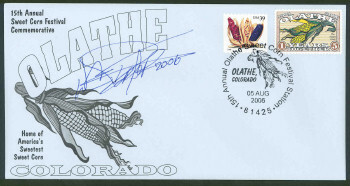 Moisture activated stamps are printed in full CMYK color by THE OLATHE POSTE of Olathe, Colorado. Sheet size is 8.5" x 3 11/16" and each sheet is initialed and numbered by the stamp designer. Sheets are packaged in heavyweight, protective plastic sleeves with a heavy stiffener for maximum protection of your investment. Don't Delay! Less than half of the original 60 sheets printed remain of this Limited Edition.